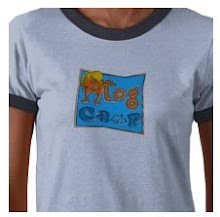 as we learned at the first blog camps, there's not much actual blogging done. because it's just so much fun to be together and talk in person. so, we know better than to commit to a whole lot of online stuff (i never did get stickam working properly) at times we likely can't adhere to (because that's the other lesson...when 5-6 people are walking along, taking pictures of stuff, it takes way longer than you think). instead, we are coordinating with blog camp 2.1 in reno and have agreed that we will take photos at certain times of the day and post them as soon as we are able. due to the 9-hour time difference, we will not try to post simultaneously. instead, we will each take pictures at the same time of day, when it's that time where we are and we'll post them. that way, in the week afterwards, we'll be able to compare photographic evidence of what each group was doing. (i hope this makes sense, i'll admit it's getting late here as i write this). additionally, we will take pictures at the following appointed times and if we are at even remotely in front of the internet at these times, they will be posted as close to the appointed time as possible. so, we do hope you'll check in with us and see what we've been up to. and we'll do our very best to get these pictures up as close to the appointed times as possible, for the benefit of all of you vicarious blog campers. and of course, like other blog camps, we'll definitely be gathering all of the best quotes and funny memories to share here in the week or so afterwards. Oh yay what fun!!! I can't wait for the arrival pics as I will have been travelling for like ummm freakin' forever, it's a four hour drive to the airport and a twelve hour flight with a lay over... Damn I must get the keenest blog camper ever award!!! Can't wait!!! I can't believe I'm not going to be there for this one! :( I'll be here anxiuosly waiting for photos!